Italian | poor scientist. will blog 4 food. Sorry about the title of this post; I simply couldn’t resist the silly joke from Austin Powers. hehe. Anyway, now that I’m done with the Japan posts, my next goal is to breeze through the rest of 2009 as quickly as possible. Who needs to live in the past? Not me! Plus, with my ailing memory, it’s frankly very difficult for me to remember what I ate last night, let alone the food I had months ago. In the beginning of October, I flew to Charleston, SC to attend J&N’s big fat Greek and Southern wedding. Charleston is renown for its cuisine and the weekend was full of culinary delights! On Friday, J’s mom and sisters hosted a Bridal Tea at The Thoroughbred Club. On the menu: open-faced finger sandwiches, scones and crumpets, tea cakes and more! Everything was so elegant; I really felt like I should’ve been wearing a big ol’ hat with a gigantic bow. 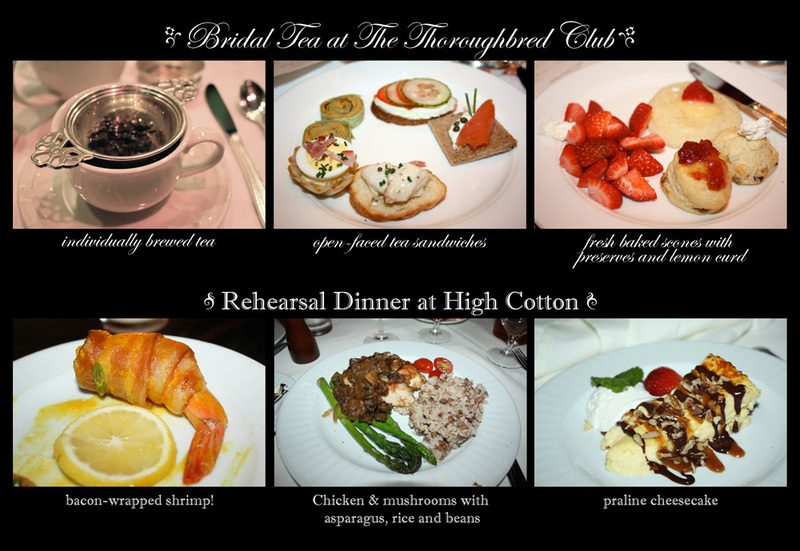 In the evening, the rehearsal dinner was held at High Cotton. The highlight for me was the bacon-wrapped shrimp hors d’œuvres – YUM. Dinner was good too, with a creamy crab bisque, chicken with mushroom sauce (chicken marsala? ), steamed asparagus, and rice and beans. I was really full but managed to have a few bites of the tasty praline cheesecake. At the pre-reception cocktail hour at the Francis Marion Hotel, I helped myself to delicious Firefly sweet tea vodka + lemonade cocktails, which J had introduced me to back in August at her bachelorette weekend. There was a salad (no photo), followed by a filet mignon AND crabcake with asparagus (so good), and wedding cake (also very good, though again, no photos. Sorry — the Firefly must have kicked in. haha.) It was a fabulous wedding weekend! I had so much fun with catching up with friends from grad school and hanging out with the bride and groom and their warm, welcoming families. Congrats J&N! J&N leading the guests in a traditional Greek dance. The main course: filet mignon, crab cake, mashed potatoes, and asparagus. In the middle of October, I celebrated another birthday. The theme was “let’s pretend we’re 10 again!” Following lunch at In-N-Out, we went to play putt-putt, laser tag, and arcade games at the Scandia Family Fun Center. Everyone got High School Musical goodie bags and the winning team at mini-golf went home with mini/airplane bottles of liquor. (Hey, just because I was pretending to be 10 again didn’t mean I was gonna give up adult fun too!) In the evening, we went to the Albatross for Pub Quiz, which was a lot of fun even if my team (High School Musical: The Team) didn’t win. A few nights later, M&K took me out for a birthday meal at Trattoria La Siciliana in the Elmwood neighborhood of Oakland. It’s a great little Italian place that does family style meals and is cash only, FYI. We started with freshly baked Italian bread and the house dipping oil (so good). Then we had the stuffed zucchini (delicious! ), followed by mushroom ravioli (best ever), chicken and potatoes in tomato sauce (just so-so, not pictured), and broccoli rabe (very good, not pictured). 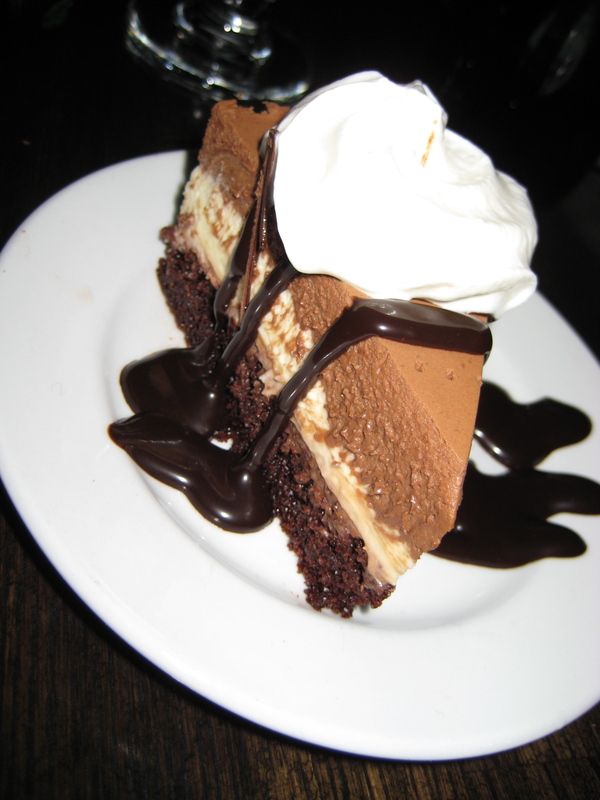 For dessert, we got the chocolate cake which never disappoints. An excellent meal! Also in October, KH and I visited the then-newly opened Burger Bar, one of the restaurants owned by chef Hubert Keller. I ordered the Black Jack burger, an Angus beef patty with Monterey Jack cheese and olive tapenade ($13.75). The burger was good but not great. The tapenade was an interesting twist, but the beef was sorta tasteless. As for the fries — I’m totally serious and I don’t mean this as an underhanded compliment — they are as good as McDonald’s fries, thin and fried perfectly. KH’s burger was much tastier, in my opinion. She got the Kobe beef burger ($16) which was super juicy and tender. Instead of regular fries, she opted for the sweet potato fries, which were also very good. Service was quite slow but I assume that it was because they had just opened and were still working out the kinks. Hubert Keller was actually there to ensure that his new restaurant was off to a good start. I took a photo of him from afar because I was too shy to approach him, and also because he looked pretty busy, so I didn’t want to disturb him. Categories: photos, random, restaurants, travel | Tags: afternoon tea, burgers, celebrations, Charleston, fried things, Italian, Oakland, San Francisco, wedding | Permalink. It feels weird to be going back to blogging about food after the travel posts, especially since I still have plenty of pre-Taiwan/Japan posts from way back. Anyway, let’s get to it! Following brunch, we tried to stay cool and escaped to R&J’s fabulous rooftop deck where there’s a great view of the Hudson River. R wrestled up a delightful midafternoon snack of nuts, tomatoes, crackers and cheese. We read the Sunday New York Times, J took a nap, I played with my new camera, and we all chatted. It was great. The next thing I knew, it was dinner time. 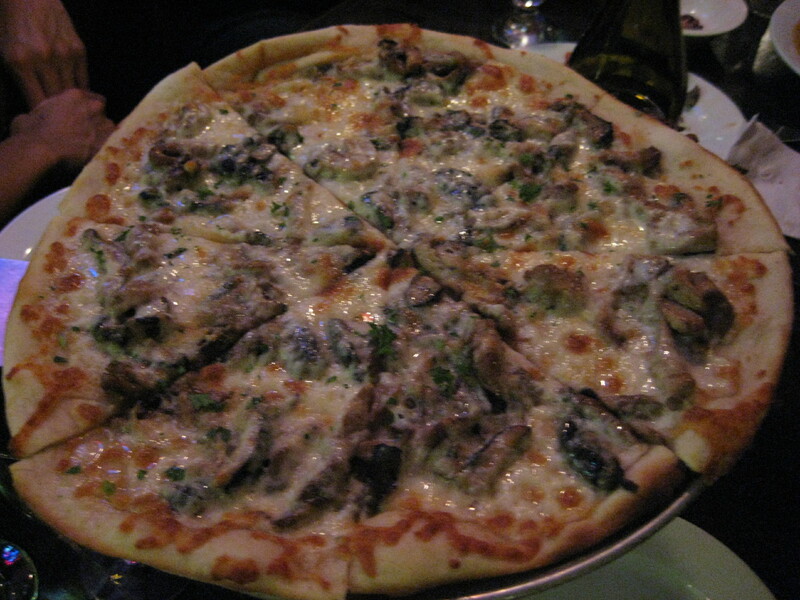 We headed over to Gennaro, one of R&J’s favorite Italian restaurants. 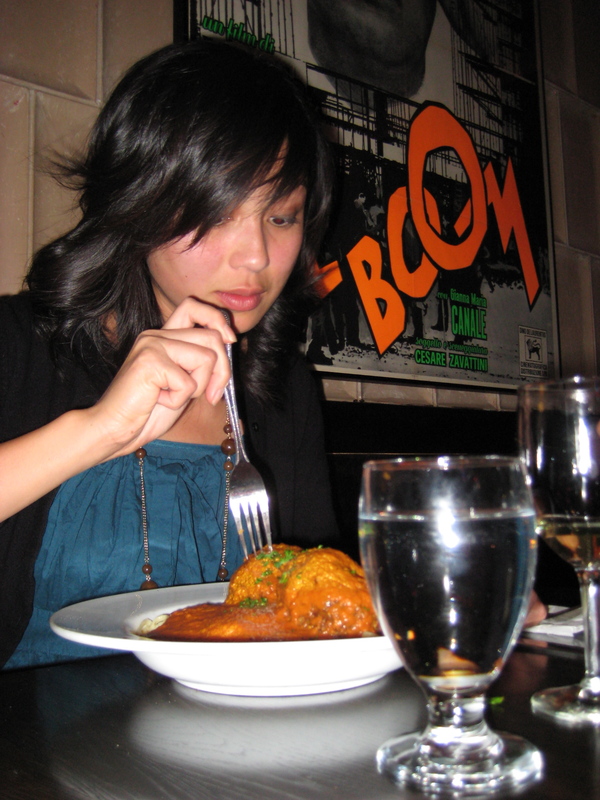 Indeed, it was amongst the best Italian food I’ve ever had. (The best being my friend AC’s mom’s authentic Italian cooking. Yum.) We started with the grilled seasonal veggies, and I ordered the linguine with swordfish. The pasta was cooked absolutely perfectly. I’m not sure I fully understood the meaning of al dente until I had pasta at Gennaro. The bread was crusty (not pictured) and awesome. Perfect linguine + swordfish. Delish! J had parmesan cheese with pasta on the side. A fabulous day with great food and great friends! 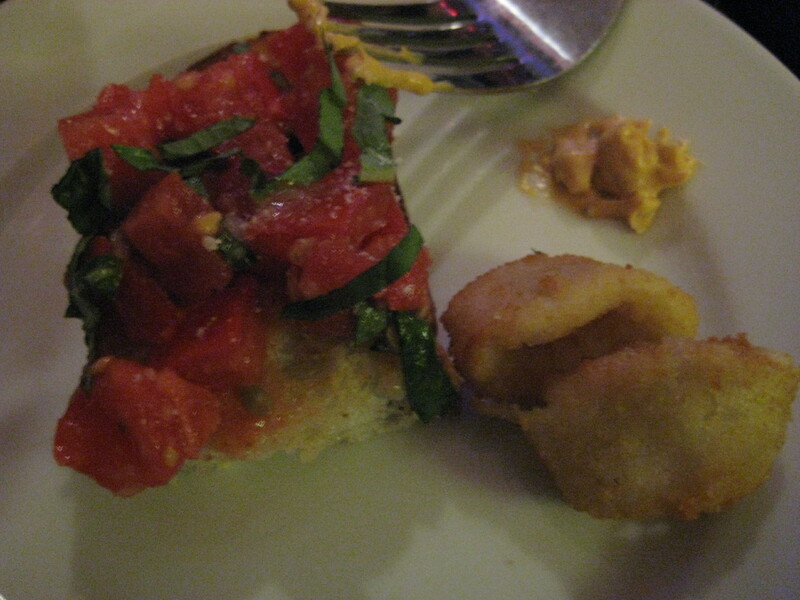 Categories: photos, restaurants, travel | Tags: brunch, Italian, New York City, pasta | Permalink. It was my birthday last week. Tuesday, to be precise. Now, I’m not one of those people who celebrates on the weekend before or the weekend after. The birthday celebrations MUST happen on my actual birthday; anything less is unacceptable. Being that my birthday fell on a weeknight, I decided to play it low-key and local. Dinner with a small group (that ended up being 14) at Fellini’s, a no-frills Italian place within walking distance of my apartment. 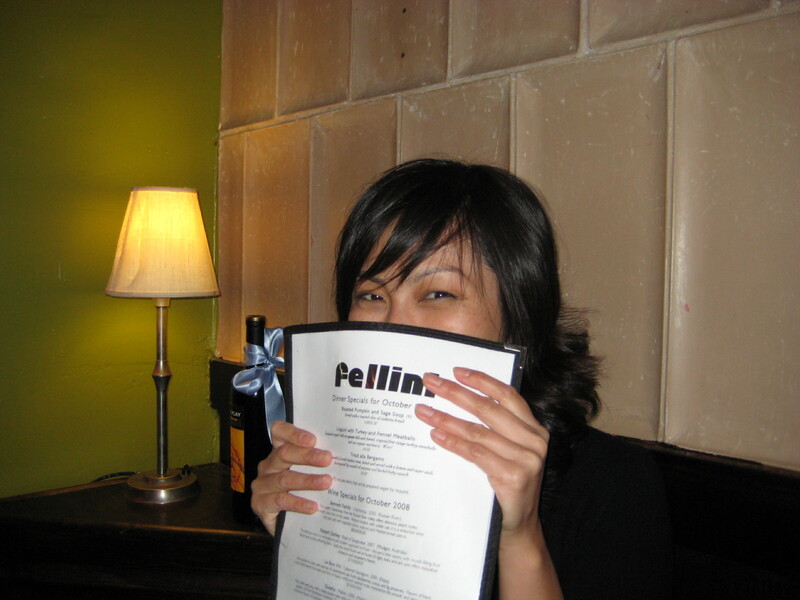 The perk of going to Fellini’s on a Tuesday night is that they waive the corkage fee. Being the thrifty drunk that I am, I showed up with 6 bottles of wine! (Don’t worry; I shared.) After dinner, more revelers joined in for drinks at the Albatross, a great pub in Berkeley with darts, Connect Four, popcorn, and relatively nice bathrooms. I was put in charge of ordering appetizers for the entire group, and decided on bruschetta, calamari and a green salad. Everything was great, but I have to say that the calamari was the best. It’s nice when the breading isn’t so overwhelming and you can still taste the squid — which, in this case, was fresh, chewy, and tasty. Next up: main course. 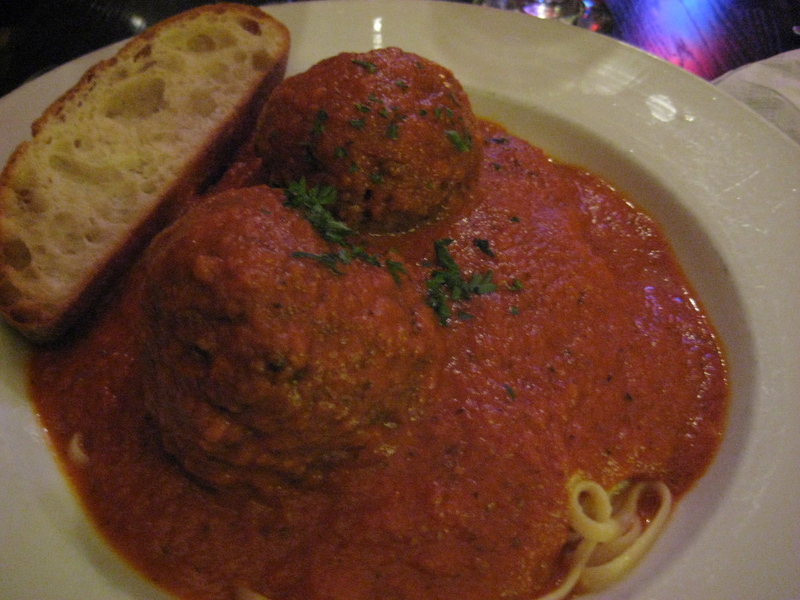 I ordered one of their specials: turkey and fennel meatballs with linguini. While it was good (and very filling), I have to say that R&J ordered the BEST PIZZA EVER. It was a shittake and oyster mushroom white pizza that was bursting with garlic, olive oil, and deliciousness. Everyone seemed pleased with their food, which made me happy. The shittake and oyster mushroom pizza was outstanding. Finally: dessert. I ordered the Chocolate Crème Gateau, which they describe in the menu as, “A moist layer of chocolate cake topped with a white chocolate mousse and finished with a creamy mocha mousse.” Chocolate, with chocolate, with more chocolate? Sign me up!! 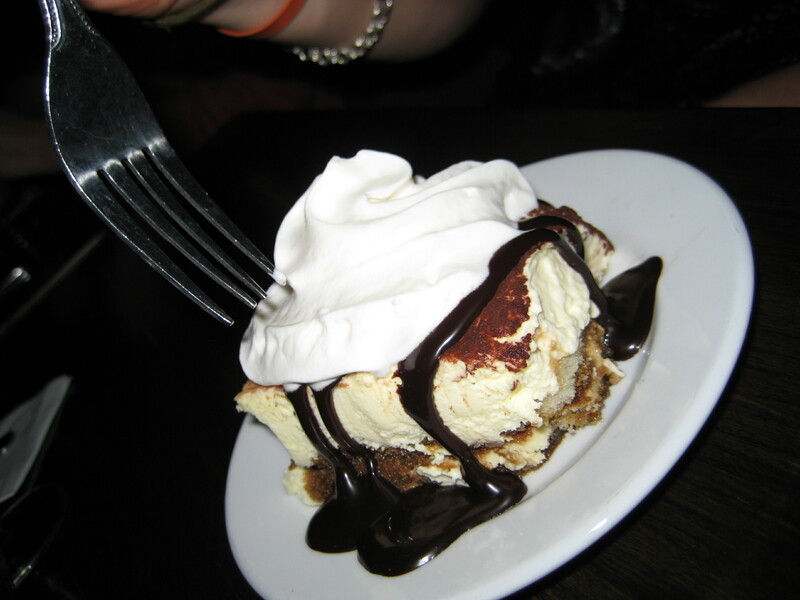 A tiramisu was also ordered and shared. Both were great, though I favored the gateau which was airy and sweet without being too over-the-top. Major bonus: they brought it over with a candle on it! But you know what was the best part of this meal? My friends who were there to celebrate with me! Because the greatest meal in the world wouldn’t be quite so delicious without good company, and I definitely had some delightful company on hand that night. Thanks guys! Categories: Berkeley restaurant, photos | Tags: Berkeley restaurant, celebrations, Italian, photos (food), photos (me) | Permalink.